Signal Finders like this one from King Controls make it easy to aim an antenna without hurting your back or even having to get up on the roof. They’ll tell you what direction you can find signals, and if you note the compass heading then all you have to do is point your antenna the same direction and you’re done. They’re not essential, but if you aim more than one antenna a month, they’ll save enough time to pay for themselves. The signal finder is really just a very, very directional antenna. We use a measurement called “beam width” to determine how off-aim you can be with an antenna. If the antenna’s beam width is 60 degrees, that means your aim can be up to 60 degrees off before the signal drops. With a signal finder, the beam width is more like 5 degrees, so it’s very precise. The signal finder also has a little bit of logic in it to figure out how strong a signal is as well which makes it easy to figure out if you’re seeing a reflection or if you’ve honed in on the actual broadcast signal itself. 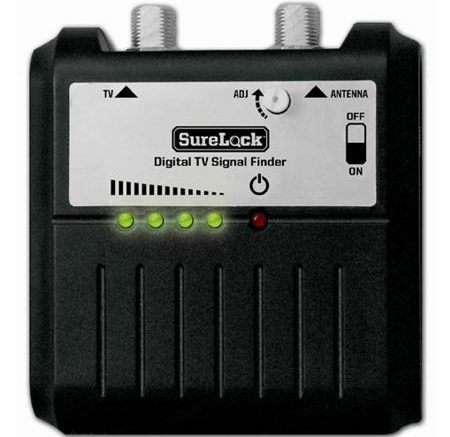 The term “signal finder” is used for devices like the one in the picture that look for all frequencies at the same time, while a “signal meter” only listens on one frequency at a time so you know what channel you’re getting. Signal finders are a lot less expensive. Don’t let data caps ruin your entertainment experience!